info: in the southwestern part of the forest, called ‘Keldergat’, trees have been felled this year (wood extraction). Trunks and crowns are lying in various places in that part of the forest and there are piles of firewood along the trails. From 1 March to 30 June however, the wood extraction stops (“schoon” time) and the loggers are not allowed to continue their work. “Schoon” time comes from the German “Schonen” meaning ‘save’, ‘protect’. The “schoon” period helps to protect the vegetation (spring flowers), to ‘save’ and not to disturb the nesting birds. Permission for commercial or professional photo shoots, with or without models, or film recordings must be requested via the box office. In the Hallerbos you must always stay on the paths, also when taking pictures and filming. The soil and vegetation are fragile and very sensitive to trampling. The use of drones is not allowed in the forest. 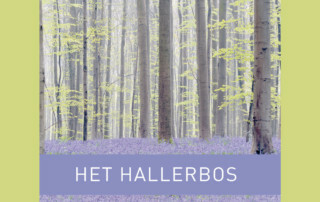 For the Hallerbos enthusiasts, there is now a book with wonderful pictures. Covered topics include history, geology, plants and animals, forest management and the future of the forest. Through growfunding (crowdfunding to grow trees) money was gathered to publish the book. The book is in Dutch, but every chapter has a summary in English and French. 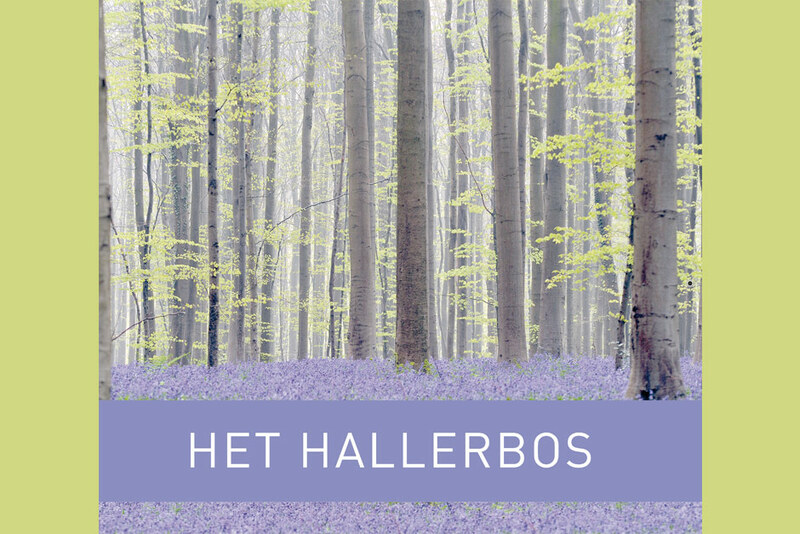 Profit is exclusively used to grow new trees in the Hallerbos. The purple-blue carpet has now completely disappeared. Only a few flowering bluebells are left, but most have withered. The young beech leaves stay transparent and create a very soft and peaceful light in the wood. Male catkins of beech are on the trees and on the ground. Two weeks ago, they caused yellow clouds of pollen in the forest. We have to wait to see if there will be a lot of beechnuts in autumn. The fruits of the bluebells start swelling. In June, the seeds will fall on the forest soil around the mother plants. In autumn, a root will emerge from the seed and this root will try to draw the seed deeper into the soil. What it needs to succeed is airy ground, so unfortunately it will not succeed where visitors and photographers have been standing on the centuries-old airy soil. The traces of visitors that left the paths will stay as permanent scars in the vegetation. On these places, nothing is left of the bluebells’ leaves either, not giving them the chance to form a new bulb for next year. Moreover, through trampling, the soil has become too dense for new plants to sprout. This will stay a bare patch. These look like paths, but only a month ago they were not there. Instagram, Facebook and Twitter have been filled with countless pictures of bluebells, and selfies; the forest has again lost numerous bluebells forever, and has many new bare patches. Why not enjoy without destroying what is so beautiful, fragile and rare? It’s a sin. You can not walk in a picture of a forest with flowers, and you can’t smell the bluebells either. You can only do that in a real forest with flowers. Only if these flowers have not been destroyed. Soft, fragile green and light blue-purple colour the wood now. The bluebells are withering and are getting paler. Under the oaks, they don’t stand out at all. Only in the beech stands with little undergrowth, the enchanting wood can still be enjoyed for a little while. The fragrance of bluebells is still in the wood, but it is getting harder for the sun to reach the flowers. The bluebells are in the shade most of the time, the sunlight on them getting more scarce. Many of them are still in their buds, as they only had a very short time this year to enjoy the light and the warmth. The canopy of the beeches is covering them almost fully now. Fortunately, the young beech leaves are still transparent, and the wood stays enchantingly beautiful on a sunny day. Meanwhile, a lot of spring flowers are flowering: lords-and-ladies with its mysterious inflorescence, graceful herb-paris, conspicuous garlic mustard along the paths, greater stitchwort with its split white petals, Solomon’s seal with its discreet hanging flowers and yellow archangel with its gaping yellow flowers, welcoming pollinators. The beautiful time is coming to an end. A lot of bluebells start withering. The beeches get more and more leaves as the days go by, leaving less and less space for the sun to reach the flowers. The bluebells start turning pale. But the wood will still be enchanting for the next few days, nice to walk and to relax, do not wait too long to come and enjoy it if you have not been yet. The fresh green transparent beech leaves give a soft diffuse light. In the damp, calcareous valleys, ramsons is flowering abundantly, which is earlier than in previous years. Pendulous sedge with its graceful hanging inflorescence is flowering, as well as sweet scented bedstraw with its fine white flowers, but it is rare in the wood. This weekend is the last weekend of the free shuttle-bus, from Saturday up to and including Tuesday 1 May. More information.